"[Sagittarius] is a centaur--part man and part horse, and he is an archer. The word Sagittarius means 'The Archer.' In Akkadian, he is called Nun-ki, which means 'The Prince of the Earth.'. ...this depicts Christ...the victorious one--the risen and victorious king. He comes now as an archer... destroying Satan... 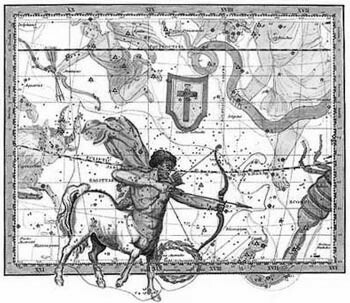 The human portion of the Centaur is drawing a bow and aiming an arrow at Antares, the very heart of the Scorpion... So here we see that Christ, the Conquering One, is the One whose arrow is aimed at the Scorpion. Kennedy's exposition of the Book of Revelation is typical of Reformed theology, which derives its eschatology from St. Augustine, the 'Father of Roman Catholicism'. Augustine's City of God served to advance the agenda of the Roman Catholic Church, which was to establish the Kingdom of God on earth. Rather than interpreting the book of Revelation as a prophecy of the end times, Catholic and Reformed theologians allegorize the prophecies in order to apply them to Christ and the Church. Dispensational eschatology, which seeks the literal sense of Scripture unless a symbolic interpretation is warranted, contends that Rev. 6:1 cannot be spiritualized as Jesus Christ coming forth in glory to conquer Satan, the reason being that this occurs after the Tribulation period in Revelation 19. Correctly interpreted, Revelation 6:1 is the first Seal Judgment which commences the Tribulation Period. The Anunnaki were actually the Nephilim of Genesis 6, fallen angels who mated with human women. The Centaur, therefore, represents a hybrid man and devil! Contrary to pagan mythology, the Anunnaki did not create mankind but instead produced the demonic race of giants which God judged with a great flood. The son of Enki, Nun-ki — whom D. James Kennedy erroneously identifies as 'The Prince of the Earth' who 'depicts Christ'— was, in fact, sired by Satan. Such blasphemies abound in The Real Meaning of the Zodiac; in fact, it is asserted that nearly every beast of the Zodiac portrays the Lord Jesus Christ in His Messianic work of redemption. As the reader works his way through this heretical material, a very alien picture emerges of another Christ and another gospel. "The Galaxy, Macrobius says, crosses the Zodiac in two opposite points, Cancer and Capricorn, the tropical points in the sun's course, ordinarily called the Gates of the Sun. These two tropics, before his time [Aries], corresponded with those constellations, but in his day [Pisces] with Gemini and Sagittarius, in consequence of the precession of the equinoxes; but the signs of the Zodiac remained unchanged; and the Milky Way crossed at the signs Cancer and Capricorn, though not at those constellations. The first decan, or minor constellation, in Sagittarius is Lyra, which astrologers have cast in the shape of a lyre or harp. Astrologers, including D. James Kennedy and E. W. Bullinger, combine the lyre with an eagle rising. The rising eagle is extraordinarily similar to the symbol on the Great Seal of the United States, which we learned in the section on Scorpio symbolized the rebirth of mankind after its annihilation. 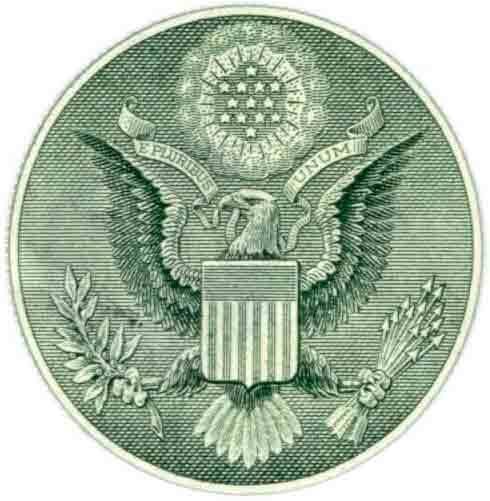 Note that the Great Seal even incorporates Lyra's harp, albeit camouflaged with the American stripes! What is the symbolism of the lyre or harp in the Great Seal and Lyra, the Harp as interpreted by astrology? In the pre-flood world, musical instruments were invented by the descendants of Cain for pagan worship. "Its brightest star, a, is one of the most glorious in the heavens, and by it this constellation may be easily known. It shines with a splendid white lustre. It is called Vega, which means He shall be exalted. Its root occurs in the opening of the Song of Moses, quoted above. Is not this wonderfully expressive?" (Bullinger) 939 "Lyra"
Rev. Kennedy agrees with Rev. Bullinger. "A very bright star in [Lyra] is Vega, a glittering gem in the night sky, and means 'He Shall Be Exalted'. Vega has been this star's name down through antiquity. It is the name which God Himself gave to it that He should be exalted—that Christ has come forth conquering and to conquer. What should be our response to that? Our response should be: He shall be exalted! It is interesting that this term is found in the song of Moses, after God overthrew the forces of Pharaoh in the Red Sea: 'I will sing unto the Lord, for he hath triumphed gloriously' (Exodus 15:1). Contrary to this false teaching, Vega does not mean 'exalted' but precisely the opposite. This Arabic word means "falling." As a matter of fact, it means 'falling eagle'—as in Lucifer, symbolized by the eagle, falling from heaven! Vega. Medieval Latin, from Arabic (an-nasr) al-w qi‘, the falling (eagle), Vega: al-, the + w qi‘, falling, active participle of waqa‘a, to fall; see wq in Semitic Roots. The American Heritage® Dictionary of the English Language, Fourth Edition. Copyright © 2000 by Houghton Mifflin Company. Published by Houghton Mifflin Company. All rights reserved. Kennedy, Bullinger, et al, do err in identifying Vega a symbol of Christ, the Exalted One, for it is obvious that the Christ symbolized by Vega is Lucifer, the Fallen One! Vega's placement in the constellation of Lyra, the Harp, is most Biblical. Lucifer was created as the most brilliant of all of the angels and occupied an exalted position in Heaven, below only the Godhead. Before his rebellion, Lucifer appears to have led the worship of God in musical ways, being the chief musician of Heaven. When he presumed to exalt himself above God, Lucifer was cast down to earth where, through the ages, he has craved the worship of men and has often been the object of their worship. Moreover, the worship of Lucifer has typically been accompanied by music of the occult genre. During the Tribulation period, the music which will accompany the worship of Lucifer will also facilitate altered states of consciousness and even levitation. According to The Fixed Stars, the star, Vega, gives the appearance of being pale sapphire. Ezekiel 28:13 (above) states that, prior to his expulsion from heaven, Lucifer was covered with precious stones, and among these gems is mentioned the sapphire. Occult sources correctly describe Vega as a 'falling vulture'. The Fixed Stars states that the Vega vulture is based on the Greek myth of Orpheus, who was the greatest of all musicians and the first rock star! In Babylonian astronomy, Vega, alpha Lyra, is identified with Dilgan, the 'Messenger of Light', a name also applied to other stars. At one time Vega/Wega was the Pole-star called in Akkadian Tir-anna 'Life of Heaven', and in Assyrian Daya-same ('Judge of Heaven'), as having the highest seat therein; but fourteen millenniums have passed since Wega occupied that position. In Egypt it was Maat, the Vulture-star, when it marked the pole,- this was 12,000 to 15,000 BCE, and it was the orientation point of some of the temples at Denderah, probably 7,000 BCE,- one of the oldest dates claimed in connection with Egyptian temple worship, because of the precession of the equinoxes, it is no longer the Pole Star; 'the still point in the turning world'. The Indians called this star Abhtlit, 'The Victorious One'. This was a star of good omen signaling the defeat of the Asuras by the gods (the triumph of good over evil). The Arabs called part of this constellation (alpha, eta and zeta) Al Naar al Waki, the swooping "Stone Eagle of the Desert". The word Vega, derives from this Arab name and means the "Plunging One". [SLM p.284]." (833) "Lyra"
Ominously, Vega (aka Lucifer) is regarded as the 'Judge of Heaven', which Richard Hinckley Allen identifies with Ma'at in Star Names: Their Lore and Meaning. Ma'at was last seen in the section on Libra as the 'Scales of Justice'. "The Egyptians also saw in Libra, a set of Scales, called 'the Scales Of Maat', one in which the human heart was to be weighed after death." (833, 'Libra') The reader will recall that Ma'at was 'the spirit of Freemasonry;' indeed, Ma'at, the judge of mankind, is Freemasonry. It appears the Freemasons have appointed themselves the judges of mankind! Yet how very telling that Ma'at is also Vega, i.e. Lucifer. On a planisphere, at 8 p.m. on November 22, the day Noah on which disembarked from the Ark, Vega corresponds to the capstone of a pyramid known as the Summer Triangle. The vernal equinox, on or about March 21, marks the beginning of Spring. It also marks the sign of Aries, when, according to Aleister Crowley, the Great Work of transforming humanity begins. "The Celts celebrated eight religious holidays, all of which were accompanied by sacrifice. (These are identical to the eight sabbats observed by witches and Satanists today.)... The four major feasts were: Imbolc, 1 February, the feast of renewal dedicated to the goddess...Brigit; Beltain, 1 May, honoring the ancient god Belenos; Lughnaza, 1 August, the festival of the god Lugos; and Samhain 1 November, the Celtic new year and feast of the dead, which was celebrated on 31 October.